This fun, swirly mandala is part of the Infinity Collection. Mandalas are intricate circular designs that are supposed to represent the universe. 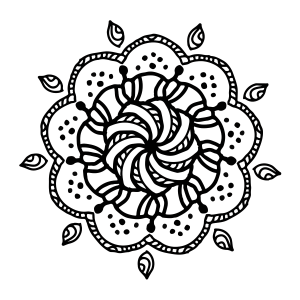 Coloring mandalas can be both fun and therapeutic for children and adults alike. We’ve selected a variety of mandala designs, some are more intricate than others, some are floral, some are more modern. This design is available as a free downloadable printable. All designs can be downloaded as high quality vector PDFs, which give smooth, unpixelated artwork for the best available print.